Rarely can we summarize the times we live in so clearly and concisely that (if you don't already see and understand what is happening globally) after reading this article, anyone who wasn't sure at first but is paying attention to developments shouldn't have any trouble seeing the end game agenda at play. “process that results in the adaptation of an organism to its environment by means of selectively reproducing changes in its genotype, or genetic constitution. Now if you read the definition of natural selection and insert the words “consciousness and awareness” as a replacement to the words “genotype” and “genetic constitution” you'll immediately get where I'm going with this. Also, if you consider that “consciousness and awareness” of the times we live in is easily another “aspect of the life cycle” then you'll see exactly my point here. We're talking survival of the human race and anyone reading this article, curious about the times we live in and in the search for truth should see that being informed, aware and conscious of the evil and oppression humanity is under today is now a key component to the survival of the human race. The question then becomes, are we conscious creatures or not? And doesn't that very consciousness appear in the equation determining whether we will survive or not? The answer is absolutely yes! Before I begin I want to say that the beauty of seeing these 3 wars is that it will help you categorize and identify the work of other activists and revolutionaries of our times. You'll be able to see which of these three categories they are fighting for and if your favorite activist is fighting for 2 of these 3 categories or even all 3. 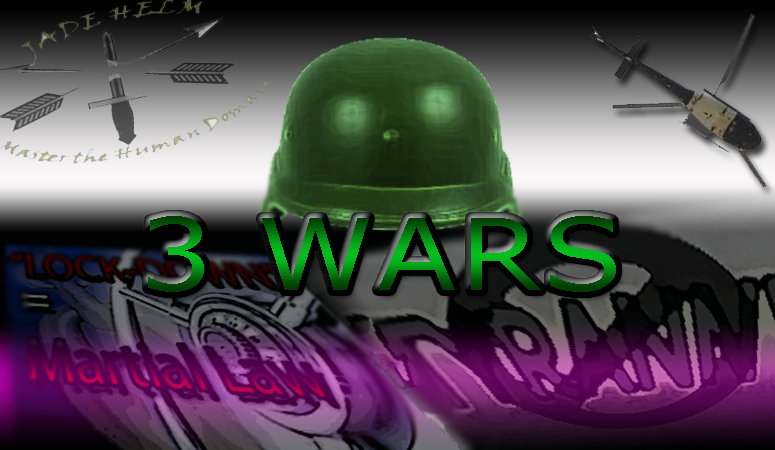 If nothing else, understanding these 3 wars being waged against humanity will help you simplify your understanding of the information war we are currently in and it will help you more clearly see the goals of the new world order so that you can more easily pick and choose how you are going to fight them. The first of these 3 wars being waged against humanity is a war against nation states. Interestingly, in terms of political parties and the artificial left-right paradigm we see constantly promoted in America, the war against nation states is traditionally led by the Right Wing Republican party. Traditionally that is. Even though both Democrats and Republicans deep down have few differences, the outward war against nation states, at least the rhetoric is traditionally spearheaded by the Republican party. From the 9/11 false flag attack on America to justify the endless phony war on terror to the creation of Al Qaeda and ISIS and the US military's, CIA and the Pentagon's ongoing foreign policy of endless war on nation states. The Secretary of State, Intelligence, and military brass have been systematically waging wars by spreading propaganda, arming proxy armies, waging psychological warfare in foreign nations, hiring mercenaries, trading arms with the enemy and much more for decades, all to facilitate the destruction of nation states like they have in Iraq, Sudan, Yemen, Libya, Afghanistan and now Syria. Anyone can read the Neocon PNAC plans and see this plan was in place long ago. And anyone can see that the purpose of the NATO alliance is for this very purpose of global conquering of nation states. We all know about the ongoing illegal foreign wars but you may be wondering what else is being implemented right under our noses to destroy nation states? Much more subtle than outright wars and invasions are things like United Nation's Agenda 21 and Agenda 2030 “sustainable” global living plans. This component of the war against nation states is much more dangerous since it is being implemented by consent. Interestingly this is where the baton is handed by the Right Wing Republicans to the Left Wing “progressive” Liberals. Understanding what I'm about to say will help you see exactly how the ruling elite use the Left-Right paradigm to perfectly suit all their agendas against humanity. So while the Left is scolding and chastising the Right about it's wars of aggression, they gladly pick up the baton and (under the dogma of the global warming lies) call for corporations and people to be responsible for the planet. This is why it is so important to understand the deception behind the climate religion and it's vital role in not only the undermining of the nation states but the actual formation of the new world order. Both Republicans and Democrats have been giving more and more power to transnational corporations with illegal trade agreements (like the TPP) that undermine national sovereignty. And we've seen the Obama administration open up the borders to illegal aliens under the Left wing morality of equality and refugee care. Immigration is just another way to destroy the integrity of a nation state and again we've seen how ISIS has been used in various way including to induce more immigration and refugee issues throughout Europe, the Middle East and here in the US. It isn't enough that the ruling elite are destroying nation states and using both the Republicans and Democrats to do it. Then there is the raging war against the individual and individual sovereignty. No presidential administration has waged war against the 2nd Amendment, freedom of speech and individual rights like the Obama administration has. There have been over 160 mass shootings alone during Obama's term, many of them staged crisis actor false flag shootings in a clear attempt to awkwardly and quickly blame gun ownership for these shootings. The attempt to destroy the 2nd Amendment has been so intense and shameless that now crisis actors throughout the United States have to worry about their safety and well being as awakened Americans realize we have traitors and criminals cashing in on public sympathy over the deaths of supposed loved ones who no one has any proof ever died or even existed at any point. The ongoing war against the individual has been illustrated powerfully by the militarization of police and the American police state. The police state flexed its muscles during the Occupy Revolution of 2011 and has not let up since then. Hundreds of Americans are being murdered each year at the hands of police who often get off easy for their actions. The staged Boston bombing event brought us “Lock down” and now we're seeing today where a snow storm or in some cases a “blizzard that wasn't” in New York City can now be used as justification for a “travel ban” which is a type of lock down where anyone caught in the streets can be fined just for walking in the streets. This is simply practice for martial law since if someone wants to walk or travel in the snow it is not up to the government to decide if an individual has that right in a free country. Since the Boston bombing crisis actor staged event, we've seen numerous versions of the “lock down” where almost any event is used today as an excuse for “lock down” including a crime scene, bad weather, Intelligence rumors of possible “bomb” scares and other events. Today almost anything constitutes a “state of emergency”. All of these events are opportunities for the state to flex its muscles, intimidate the individuals of the public and strip the individual of his or her rights and sovereignty. We've also seen where parents have been losing their right to determine what education their children will be exposed to and what medications their children will be subjected to. Medical tyranny somehow has become the norm in just the last 7 years Obama has been in office. For the first time we're seeing forced vaccination and the ridiculing and demonization of anyone who believes in medical choice and freedom. Then there is the depopulation agenda at play. One need only look up and see the daily and ongoing geoengineering and chemtrails spraying of our skies that are destroying the planet as the modification of our food system with cancer causing (GMO) agents. It's no wonder why the individual is now dying at an alarming rate with cancer and many other diseases while the pharmaceutical companies and the medical industrial complex cashes in on your sickness. The war against the individual has been intensified by the private banking system, the IRS and the state. More than ever people are financially enslaved. Today over 40 million Americans are stuck in huge student loan debt, many cannot afford to pay these loans and none of them saw it coming. Many Americans are slaves to these creditors who never had that money to begin with but will harass, collect and garnish your wages if you don't pay. Who's laughing now? All of these takeovers are happening subtly and slowly and this is why we must sound the alarm about these first two wars (on nation states and individuals) that are happening simultaneously and in a coordinated fashion. As mentioned above the 2 front war is being waged by BOTH the Left and the Right. For this reason those that are still stuck in the Left-Right paradigm may find that truth seekers, liberty lovers (or “conspiracy theorists”) may agree with them partially or some of the times on some issues but not on most issues. That's because both sides indeed have some truth to what they believe but neither sees the greater picture. And neither political party wants to admit to the greater plan for a new world order. This brings us to the third and possibly most important war being waged against humanity. The 3rd war we are seeing manifest today may be the most important of all the wars because it is an attempt to block the knowledge of the first 2 wars and to destroy the messenger. It's the war on Truth itself and the very search for truth. Today we are seeing a growing attack on the search for truth as I mentioned in a previous article. We are now seeing truth seekers demonized and attacked to the point of losing their jobs (like professor James Tracy) just for asking questions and confronting crisis actors about their claims which if proven to be lies constitute a very serious federal crime. We're seeing where activist websites (like MemoryHoleBlog.com) have had their Paypal accounts terminated admittedly due to “the nature of your activities”. I want readers to know this is not an attack against the individual as much as it is an attack against the very search for truth. Now more than ever it is easier to brand someone radical or “extremist” for simply questioning mainstream media breaking news. We saw that at Sandy Hook when treasonous traitor Lt Paul Vance threatened truth seeking Americans not to question the initial narrative of the Sandy Hook hoax and he was never indicted for this crime against the freedom to ask questions and search for truth. We also have seen where a book revealing that nobody died at Sandy Hook was banned by Amazon and the nationwide media. When it's all said and done this war against truth itself is the ultimate battleground by which all activists will be tested. Everyone has to decide which side of truth they will stand and how far they are willing to go standing for truth. Now it's time to come together and understand each other. Left, Right and Center. Democrats, Republicans, Libertarians, Anarchists and plain ole truth seekers. I've stated many times there is a huge difference between the Truth movement and the Liberty movement. They often sound the same but they are not the same. When a person doesn't believe in objective truth, there's your first problem. It is impossible to get at something that you don't believe in. For without “truth” or some concept of what you think truth is, you'll never reach a consensus of what is happening in the world. We've discussed the Left-Right paradigm and how the involved parties are purposely skewed for the agenda of the ruling elite. Without both the Left and the Right acknowledging this model it is nearly impossible to get at the root of the problem we face. Libertarians on the other hand care about freedom and that's great. However if you only care about freedom then lies CAN be introduced in a way that appears to promote freedom. Well meaning Libertarians are often susceptible to military intelligence propaganda which may suggest things that are designed to point to an engineered external threat that is not true and intended to rally your support for more military action. Whereas truth seekers are not married to any one ideology other than the suspicion of government lies, propaganda and the search for truth. Nothing less than establishing a forum, a platform or an open source narrative that forces people to see the overall picture of how the different activists and political persuasions fit into this 3 front war being waged against humanity will work at getting us closer to a concrete solution. In this election year of 2016, now is the time for people to see their own political party persuasion for what it is before it's too late. Now is the time to see truth for what it is before it's too late and before truth seekers are fully persecuted. Only then will you be able to see that there is a war against truth itself. People on both the Left, Right and Center are willing and able to identify either the war against nation states and or the war against the individual for various reasons, and that is a good thing. But when will we all see that these wars are all working together with the war on truth itself in order to give birth to a global order of enslavement? I realize that some people specialize in bringing one specific topic to the general public and there's nothing wrong with that. However, we must all see the overall battlefield for what it is. The time is now to see the big picture or risk losing it all. See the 3 front war for the war is coming to you whether you welcome it or whether you realize it or not. If you agree please share this message with others.